**BRAND NEW!! ** These very cool black & white fine art prints on heavyweight arches watercolor paper 22×30 are ONLY $100 a piece. Each is artist enhanced and hand signed. 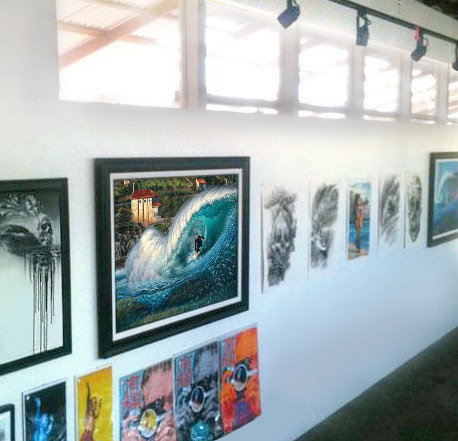 Summer is the season for enjoying the surf – and surf art! If you are in the area of Orange County stop by and check out the show at Location 1980 (Formerly World Gallery). Call ahead to schedule private showing by gallery owner, Jesse Fortune- available most days. Good Luck with your show, Phil! Wish I could be there! Phil, I’m not sure if you’re the person I’m looking for, but in 2006 (or at least somewhere close to there) I purchased a sculpture in Hawaii of a surfer riding a wave. The unique thing about this piece is that if you flipped it around one would see the intricate details of the water as well as the ocean floor. A “Phil Roberts” is signed on the bottom right of the back of the sculpture and I am hoping it is you. This is one of my favorite pieces and sadly, it recently fell and the girl that was surfing broke. I am hoping that by some miracle I’ve found the right person and that you would be willing to fix it for me. I would greatly appreciate it. My e-mail is BreeBreckenridge@gmail.com, please, please, please, reply and let me know if you were the incredible artist that made this gorgeous sculpture. Thank you in advance. follow up: It may have been in 2001.